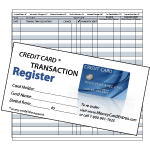 Here is a LARGE PRINT, LARGE SIZE register for general banking -- checks, deposits, ATM, debit card transactions, etc. 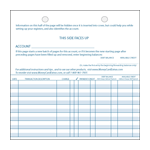 -- very suitable for those who are sight impaired, or those who simply prefer a register with larger print and rows to write in larger entries to make your experience easy on the eyes. 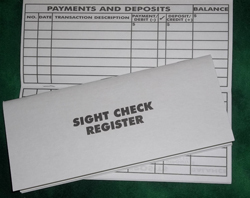 Note that the size of the register is larger than a standard check register. 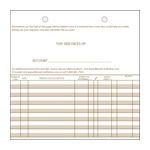 When closed, the booklet is 8.375 inches wide and 3.625 inches in height. 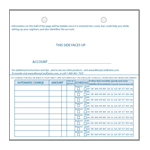 So it won't fit into a standard size checkbook cover. In the future we are likely to design one (if you help keep us in business!). 14 full pages provide 16 single-line entries per page. 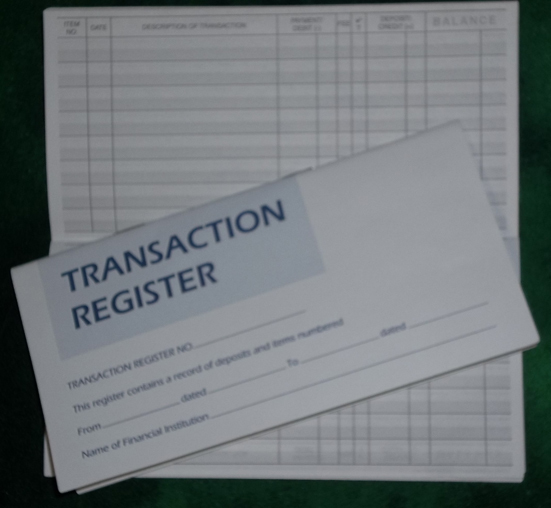 The register starts with a "booklet-page" (the lower half of a "full" page) that provides 7 single-line entries. So as a whole the register provides 231 single-line entries. The boldness of each line suggests an expectation to use the single-line method for entries, but you can simply use two lines for each transaction if you want to provide more room to amply describe your transactions. Because there are 16 single lines on each full page, evenly divisible by 2, you can convert each page into 8 double-line transactions. 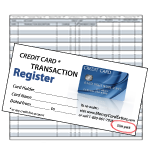 If you choose to do so, skip the last line on the starting "booklet-page" with its 7 single-lines (that is, an extra line) or simply use it to expand on the 3rd transaction (making that a triple-line entry). You may also want to draw brackets in the margins to designate each double-line segment, because the register does not have any tinted rows to otherwise help you distinguish one double-line segment from the other. We intend to improve on this design in the future to provide alternate tinted rows and other enhancements. There are three large-print calendars for 2013, 2014, and 2015, each year taking a full page, or stated more accurately, the last booklet-page of the register fully contains the calendar for 2015, the inside of the back cover fully contains the calendar for 2014, and the outside of the back cover fully contains the calendar for 2013.